간단하게 이야기 하면, 인증서의 동작에 차이는 없다. 다만 인증서를 발급해 주는 기관(흔히 CA라고 한다.) 에서 얼마나 인증서를 발행 해 주기전에 check 를 하느냐의 차이다. 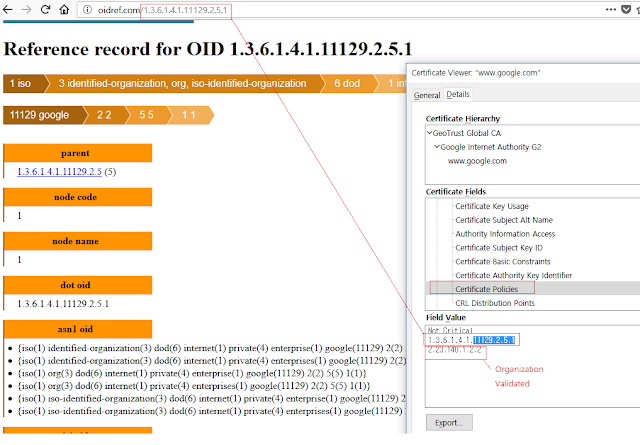 그래서 EV, OV 에는 인증서(certificate)의 Subject field 에 'O'(organization) 가 추가된다. 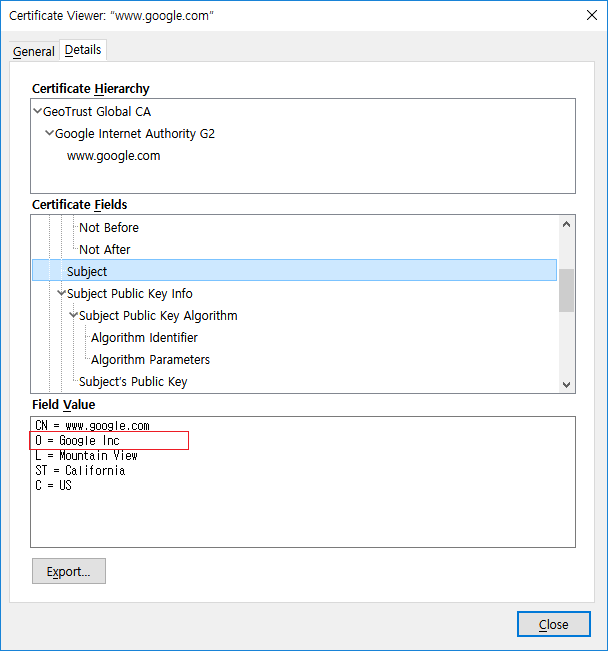 그리고 Certificate policy 의 값도 다르다. 2012년의 ref. 3 에서는 현재로서는 DV(Domain validated)와 OV(Organization Validated) 를 구분할 수 없다.고 했다. 이때는 CA/Browser Forum 에서 제시한 Baseline Requirements 가 막 나왔을 때였어서, 각 CA(Certificate Authority)마다 어떤 식으로 OV인지, DV인지 표시하는 방법이 달랐다고 한다. 하지만 현재는 2018년이니 훨씬 더 많은 CA가 Baseline Requirements 를 따르고 있을 것이라 생각한다. 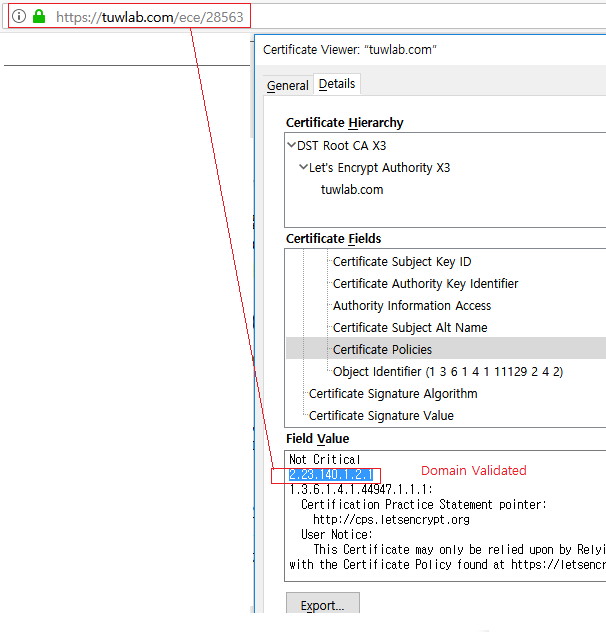 X.509 에서는 RFC 5280 에 정의된 것처럼 Certificate policy 에 어떤 종류의 certificate 인지 적는다. CA가 자신의 OID(object identifier) 를 적는다. 이 OID 는 발급한 certificate과 관련된 practices 를 적어놓은 문서를 가리킨다. http://oidref.com : 여기서 oid 번호가 어떤 의미인지 파악할 수 있다. Baseline Requirements 에서도 같은 방법을 사용한다. 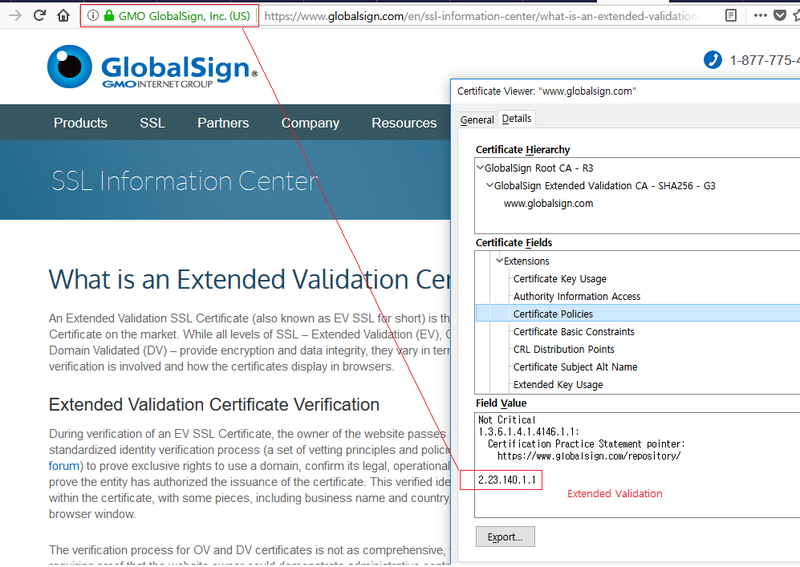 An Organization Validation (OV) SSL certificate is considered to be suitable SSL certificate for medium to large size business. 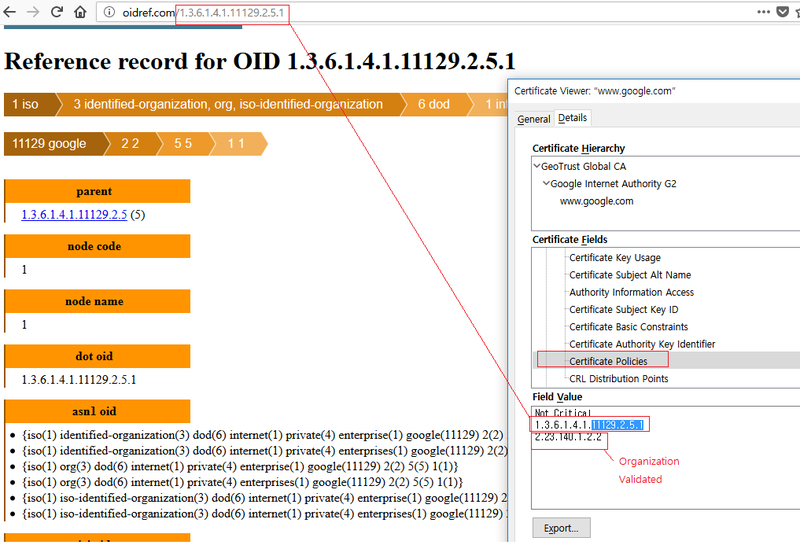 This is because it offers higher validation as compared with DV certificate and displays domain name, organization name on the certificate. The encryption offered is up to 256-bit that enhances user’s confidence in the website they are transacting on. 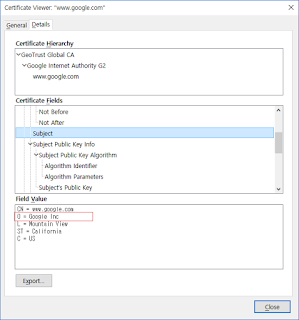 On the other hand, for the issuance of EV SSL certificate, you need to submit quite a lot of documents to the certificate authority as per their need and requirement. This stringent verification process ensures strong encryption with a green padlock sign in the address bar ensuring protection against hackers. ref. 5를 보면 EV 인증서는 발급에 대략 1개월 정도 소요되는 듯 하다. 참고로 ref. 5 에서 이야기한 저렴한 곳은 여기 같다.